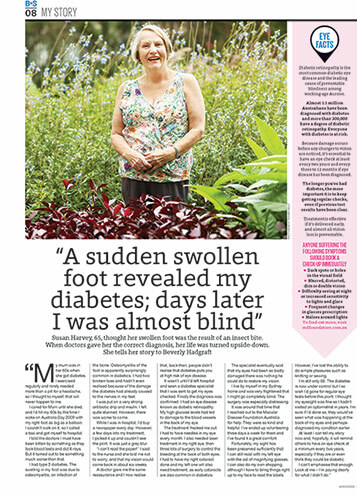 “My mum was in her 60s when she got diabetes. I exercised regularly and rarely needed more than a pill for a headache, so I thought to myself, that will never happen to me. "I cared for Mum until she died, and I’d hit my 60s by the time I woke on Australia Day 2009 with my right foot as big as a balloon. I couldn’t walk on it, so I called a taxi and got myself to hospital. "I told the doctors I must have been bitten by something as they took blood tests and did X-rays. But it turned out to be something much worse than that. "I had type 2 diabetes. The swelling in my foot was due to osteomyelitis, an infection of the bone. Osteomyelitis of the foot is apparently surprisingly common in diabetics. I had two broken toes and hadn’t even realised because of the damage the diabetes had already caused to the nerves in my feet. "I was put on a very strong antibiotic drip and insulin. I felt quite stunned. However there was worse to come. "While I was in hospital, I’d buy a newspaper every day. However, a few days into my treatment, I picked it up and couldn’t see the print. It was just a grey blur. “I can’t read the paper!” I said to the nurse and she told me not to worry, and that my vision would come back in about six weeks. "A doctor gave me the same reassurance and I now realise that back then, people didn’t realise that diabetes puts you at high risk of eye disease. "It wasn’t until I’d left hospital and seen a diabetes specialist that I was sent to get my eyes checked. Finally the diagnosis was confirmed: I had an eye disease known as diabetic retinopathy. My high glucose levels had led to damage to the blood vessels in the back of my eye. "The treatment freaked me out. I had to have needles in my eye every month. I also needed laser treatment in my right eye, then three lots of surgery to control the bleeding at the back of both eyes. I had to have my right cataract done and my left one will also need treatment, as early cataracts are also common in diabetics. "The specialist eventually said that my eyes had been so badly damaged there was nothing he could do to restore my vision. "I live by myself in my Sydney home and was very frightened that I might go completely blind. The surgery was especially distressing. "I was around that time that I reached out to Macular Disease Foundation Australia for help. They were so kind and helpful. I’ve ended up volunteering three days a week for them and I’ve found it a great comfort. "Fortunately, my sight has been preserved sufficiently that I can still read with my left eye with the aid of magnifying glasses. I can also do my own shopping, although I have to bring things right up to my face to read the labels. However, I’ve lost the ability to enjoy simple pleasures such as knitting or sewing. "I’m still only 65. The diabetes is now under control but I so wish I’d gone for regular eye tests before this point. I thought my eyesight was fine so I hadn’t visited an optometrist in years. I’m sure if I’d done so, they would’ve seen what was happening at the back of my eyes and perhaps diagnosed my condition earlier. 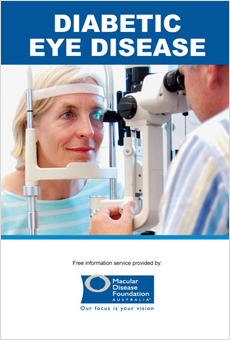 Read more about diabetic eye disease here. Order a copy of Macular Disease Foundation Australia’s information booklet on diabetic eye disease online or call the Foundation's free Helpline: 1800 111 709.